This is my year for setting goals and I have met all of them so far. My goal for next week it to set Mary T Designs up on Facebook. I am technologically challenged, so stay tuned for the result of this endeavor. I will report on my progress next week. My treasury for this week was entitled "Goin' to the Zoo". It includes some fun pieces, all animal related. There are EBW members included as always! Please take time to check it out and to visit some of the shops of the very talented artists featured. You won't be disappointed!! The piece that I have chosen to list this week is the bracelet that I created to go with the Onyx and Swarovski necklace that I listed last week. I am getting more adventurous in experimenting with different techniques and beads and this bracelet is my first piece containing bugle beads. It is also made with hex beads and bicone Swarovski crystals. If you are interested in this piece, check my shop (http://marytdesigns.etsy.com/) later this week when it will be listed for sale. 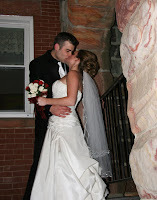 As I mentioned in an earlier blog, I made the jewelery and beaded the veil for my Son and Daughter-in-Law's wedding. The jewelery was strung, not woven which I prefer. Here is a picture of the Bride's jewelery. I did both the necklace and earrings. Below is a picture of the veil. I beaded around the outside of the entire thing and made a beadwoven piece for the comb. It was very beautiful, as was the entire day! Your new piece looks great :) And that must have been fun to do the wedding stuff! Congrats Mary. 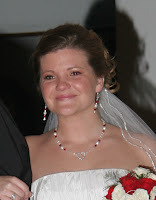 And I must say, the veil and necklace are perfect on your lovely new daughter-in-law!